WASHINGTON —U.S. Sen. John Cornyn (R-Texas) today questioned Director of National Intelligence James Clapper and Defense Intelligence Agency Director Lieutenant General Ronald Burgess on the national security threat posed by the violence along our southern border during a Senate Armed Services hearing. In response to Senator Cornyn’s questioning, Director Clapper indicated that our porous southern border posed a direct threat to our national security. Below is a transcript and video of this morning’s hearing. CORNYN: Thank you, Mr. Chairman. Gentleman, I'd like to direct your attention to violence, really a war occurring right out our back door in Mexico and to get some of your observations about that. But first, Director Clapper, I -- the Government Accountability Office has documented that there were 445,000 illegal entries into the United States across our southern border in Fiscal Year 2010. The Border Patrol has reported that, out of those 445,000, about 45,000 are immigrants coming from countries other than Mexico. It's more than 100 different countries, including at least four state sponsors of terrorism, so designated by the State Department. I would like to get your assessment of whether that represents a national security threat to the United States, a potential national security threat. CLAPPER: Well, yes, sir, it does. I think this -- you know, the issues of narco-trafficking and the prevalence of the drug cartels in Mexico is a matter of national security interest to both countries. I think it was, you know, recognized and reaffirmed by -- recently with President Calderon's visit here with President Obama. I can -- you know, from an intelligence perspective, I think we've made a lot of progress in partnering with the Mexicans, some excellent work going on down there together, which has resulted in significant takedowns of high-value targets, cartel leaders, and the like. And that will continue. We're actually, you know, I think following a pattern established in -- in Colombia. And I think Colombia is instructive, since that took a long period of time to reach the state we are now. But clearly, the whole situation there is -- is -- is a serious one. I am going to be shortly making the rounds to visit EPIC and Border Patrol and other entities down there, intelligence entities that are committed to this problem. But it's a serious one. CORNYN: I'm glad to hear that you'll be traveling to El Paso, to the El Paso Intelligence Center. They're doing some very good work down there. But, frankly, a lot more needs to be done. But would you agree with me, Director Clapper, that an individual with enough money and enough determination can penetrate our southwestern border and make their way into the United States, anyone with that sort of determination and enough money, and that that does represent a potential terrorist threat to the United States? CLAPPER: Yes, sir. I don't -- I don't pretend, nor would, I don't think, Secretary Napolitano pretend that, you know, we've got an iron-clad perfect system. But at the same time, I'd be remiss not to commend the tremendous work of the Border Patrol and ICE and others that are involved with this -- with this problem. But to say that it's, you know, iron-clad perfect and somebody could get through, yes, sir. 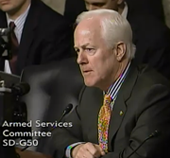 CORNYN: I think the General Accountability Office would agree with you. In fact, they state that only -- in a February 15th report that only -- that there's still 1,120 miles of our 2,000-mile southern border that is not under the control of the U.S. government when it comes to border security. So I think we've got a lot of work to do. But I agree with you, Director Clapper. We need to commend the good work that is being done, although it's under-resourced and short-staffed. And we need to do more to secure our borders, not just to restore the rule of law, but also to prevent our country from suffering terror attacks through that southern portal. I'd like to ask General Burgess, the former CIA director General Mike Hayden said that -- after he left the government, he said that as national -- as a national security challenge that would keep him awake at night, that the fact that the -- Mexico has seen the sort of drug-related violence -- some 35,000, roughly, Mexicans killed since 2006, more than 140 Americans killed in that violence since 2006 -- he said that's one of the things that would keep him awake at night, considering the proximity of Mexico to the United States, the fact they're our third-largest trading partner. And I would like to know, do you think that the United States has a coherent, meaningful strategy in place to deal with the escalating violence in Mexico? I worry that, once President Calderon leaves office, we don't know who his successor will be or what their commitment will be to continuing that fight. And I'd be interested in your assessment of that, sir. BURGESS: Well, sir, a couple of points. Probably would be inappropriate for me as the director of the Defense Intelligence Agency to comment on whether we as a U.S. government have a complete, coherent strategy vis-a-vis Mexico. From -- from an intelligence standpoint, I know -- from my days in the director of national intelligence in a previous life -- that we have worked with our friends in Mexico to ensure that, from an intelligence standpoint, we have put the processes and the capabilities in place that will enable both of our national interest, in terms of following some of the problems you have been identifying, and that we have made some progress towards that, though I would characterize it as a work in progress, as we put it together. I have been testifying since 2000 during my time, not as long as Director Clapper, in terms of doing testimony up here. And I used to refer to this -- the problem you were somewhat describing in my days at U.S. Southern Command as beams of light into the United States and that these beams of light, whether it be illegal migration or however you want to phrase the term or whether it be the drugs coming across or the weapons that are moving back and forth, that all of those are beams of light coming across our southern border. And it is a national security concern, because if you can move drugs, if you can move people, you can move other things that are of concern to us as a nation. So it is something that we need to have an interest in. CORNYN: If I could just follow up, one last question with Director Clapper. You compared what's happening in Mexico, I believe, to what -- to our experience in Colombia. There is -- how would you describe the nature of what's happening in Mexico now? There's been-- Secretary Clinton at one point characterized the situation in Mexico as an insurgency. Others seemed to walk back from that characterization. But how would you characterize it? CLAPPER: Well, I just think the whole business of -- however you want to label it -- of drug trafficking is just a very serious national security problem. It's one that we both -- both countries share in. As President Calderon points out, if it weren't for the demand here, that wouldn't generate the business down there. It's just -- it's just a serious national security concern to both countries, is the way I'd characterize it. CORNYN: You do consider it comparable to Colombia? CLAPPER: I do, in -- yes, sir, I do. And -- and in the context of -- of what I meant by that is that we learned a lot from our – our cooperation with the Colombian government, particularly with respect to intelligence and how the tactics, techniques and procedures that were used and developed and honed over a period of 10 or 15 years in Colombia, and we're applying that same approach to the extent that the Mexican government, which is a sovereign nation, to the extent that they -- they will permit us to -- to help them. And I think we are enjoying some success. But as General Burgess says, it's a work in progress. This is civility in action. Senator Cornyn asked some good questions but tolerated some really poor responses. This looks more like a polite dance than a serious discussion concerning national security. This is the current problem in Washington. One big song and dance!